Here we are in the midst of March Madness, and I am slowly coming to understand it all. I enjoyed reading Cathy Mere's March Madness post earlier this week. I could so relate to it. It's a big deal here at home...the games are on and eyes are glued to the tube. Thanks to a student's blog, I now know who Aaron Craft is of the OSU Buckeyes. So it was very exciting to see him make the final shot in the last second to bring a win to OSU 78 to 75. Now OSU moves to the Sweet 16 where they face the Arizona Wildcats. I know, you're impressed that I know all of this, aren't you? Well, that's about the extent of what I know...so you can be done being impressed. Now, if I was in charge of March Madness, basketball wouldn't be involved. I'd have Cookie March Madness or Biscotti March Madness. I guess I could probably combine the two. Biscotti is, after all, an Italian cookie. I would bring together my baking friends and have them bring their BEST cookie. We'd create our own brackets, have a taste off, and declare a winner. I'm pretty sure the Johnson special chocolate chip cookie recipe would make it to the Final Four. (See, there's something else I know about March Madness). Annie and I have tweaked the recipe from the original. These are not "back of the bag" cookies. 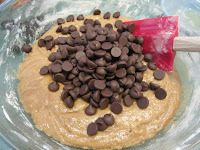 It involves browning butter, dark brown sugar, mixing and resting, then more mixing and resting, lots of vanilla and giant chocolate chips or chunks. I recently learned that the addition of Kraft Caramel Bits adds the perfect touch. Just typing this post makes me think I might need to head to the kitchen this evening. So, if you were coming to the Cookie March Madness party (I wish I was really having one. It sounds fun, right? ), what would you bring? What is your very best cookie? Please share in the comments. If you want to try our recipe, I've created a link here. Try them out. You'll never go back to your old recipe. 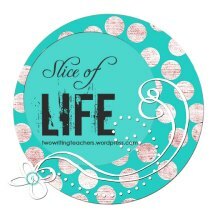 Thanks to Ruth and Stacey for hosting Slice of Life Story Challenge. You can read more slices on their blog. Oh my gosh! These sound yummy! I may have to make them. Tonight! And I'm impressed that you know the name of a basketball player! I like basketball, kind of, have watched a lot this weekend (we had a blizzard yesterday) and I don't know any players' names! Carol, Don't be too impressed. Aaron Craft is the only name I know and that's only because my student wrote about him. I hadn't heard of him before. My daughter just saw the picture on your blog and is very interested in veering from the back of the bag. March Madness lends itself to some great competitions. I'm liking the cookie idea a lot. Might have to be done in conjunction with our neighbors' annual basketball party...hmmmm. If I was coming to your cookie madness (love that idea!) I would bring my oatmeal chocolate chip m&m cookie recipe. They are awesome! Or maybe my peanut butter chocolate chip m&m cookies. Do you see the theme here? Yum! I like your idea for March Madness! Those cookies sound delicious. Today at lunch when everyone else was discussing their tournament brackets, I could offer that Dumbledore edged out Gandalf in our book character brackets! Your chocolate chip cookies sound heavenly!! Caramel bits and chocolate chips and melted butter - does life get any better than that?!! Hope you're enjoying some baking tonight. I will be trying your "Even More Perfect Chocolate Chip Cookies." They sound incredible!